SCO 88, First Floor, Sector 44, Chandigarh - 160044, Punjab, India. D.M. 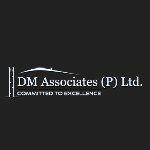 Associates (P) Ltd. is counted amongst the well-recognized Builders & Developers and Real Estate Agents in Mohali, Panchkula, Chandigarh, Zirakpur and Kharar. From Buying Property to Selling Property, from Renting Property to Leasing Property, from Construction Services to Property Legal Consultancy, we provide the cutting-edge Real Estate Solutions to the clients. We deal not only in residential properties, but also in commercial and industrial properties. Established in 1995, we have consistently opened new vistas in the industry under the leadership of our honorable CEO Mr. Madan Lal Garg . Due to his strong industry acumen, today, we have been able to establish our name as one of the most trusted Real Estate Companies. Our team comprises of professionals who work industriously to always provide 100% Real Estate Assistance to the clients. These professionals are the mainstay of our company. They have in-depth industry knowledge, which they exploit to the fullest in order to offer the clients with the effective Real Estate Solutions. Additionally, our team members keep themselves shoulder to shoulder with the latest market trends and Real Estate Scenario. This again helps them to serve the clients with the best.